Since 2013, I have been lucky enough to provide the photography for several covers of the Journal of New Jersey Dental Association. I was first contacted by Lorraine Sedor of NJDA when she saw some of my work at the Cherry Hill Arts Show. After I submitted several images, this Merlin was selected for the Spring edition. The truth is, the Merlin was photographed during fall migration near the Cape May lighthouse! 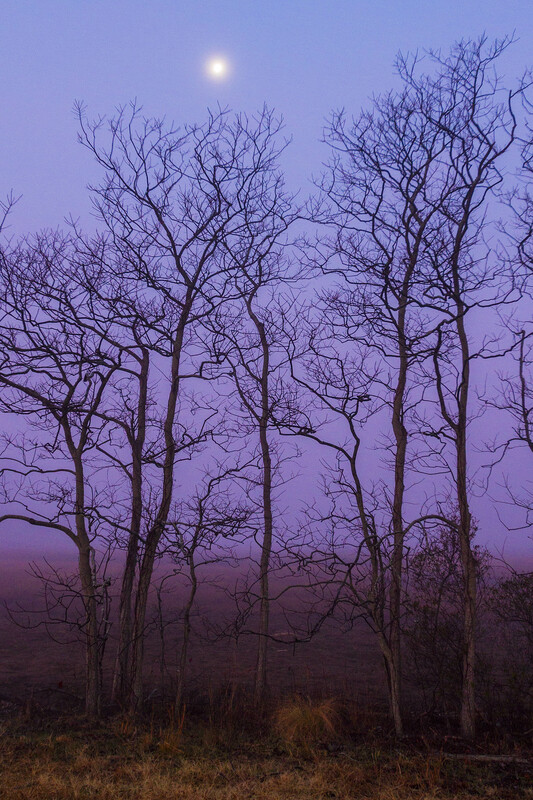 My favorite local place to photograph is the Pine Barrens of New Jersey. 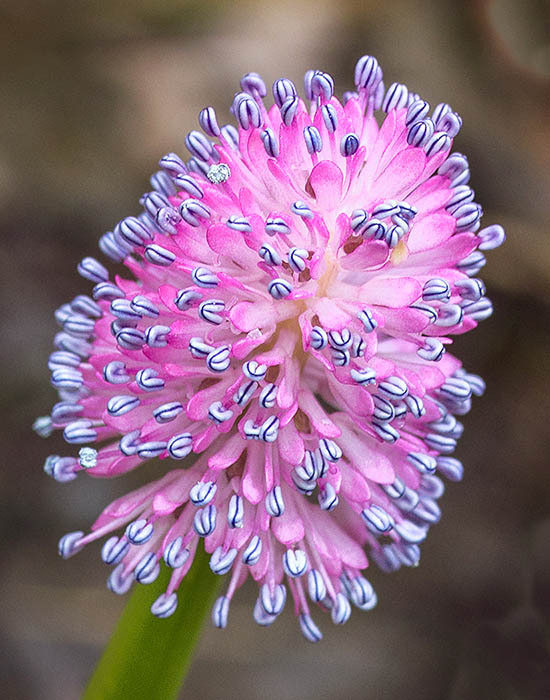 This harbinger of spring, the Swamp Pink, is a rare and endangered flower. It’s location must remain secret to protect it. Autumn is my favorite season for photography. I love the colors of the changing trees and falling leaves. This abstract “Swirl of Leaves” is my expression of the fall season. 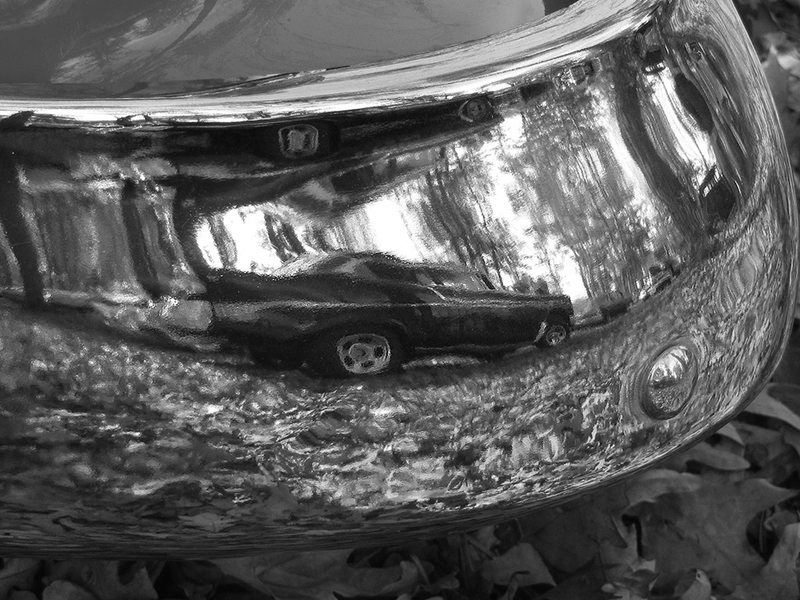 I have always been fascinated with reflections. You will see this repeating theme in my photography. This next image, ” Winter Reflection”, was taken on a cold day at Pakim Pond in Brendon Byrne State Park. After this publication, I was informed that the editors of JNJDA wanted to get away from my nature photographs so I took a break until I came up with a dental theme that they couldn’t refuse! It worked and this cover appeared in 2016. The concept for the dental toothbrush and holder came from a South Jersey Camera Club workshop. I created these neat colors with polarization sheets. My next photograph, “A Reflection on Dentistry’s Past” will be published in the fall of 2017. The journal also features an article I’m co-authoring on antique dental equipment. Thank you for taking the time to look at my photographs. I recently had my first solo photography show at the Cherry Hill Library, in Cherry Hill, NJ. It was exciting to be asked to show my work. I was asked to participate in a group show in November 2012 after winning a third place prize in the Fall into Arts Show in October, but that exhibit was cancelled due to Hurricane Sandy. Instead of being in the group show, the librarian coordinator asked me if I would like to have a solo show in June. I thought about it for about a second, and then said YES! It was a lot of work to get together 25 photographs. I’ve only been serious about creative photography for 5 years, even though photography has been a part of my profession as a dentist, veterinary dental consultant, and professor. 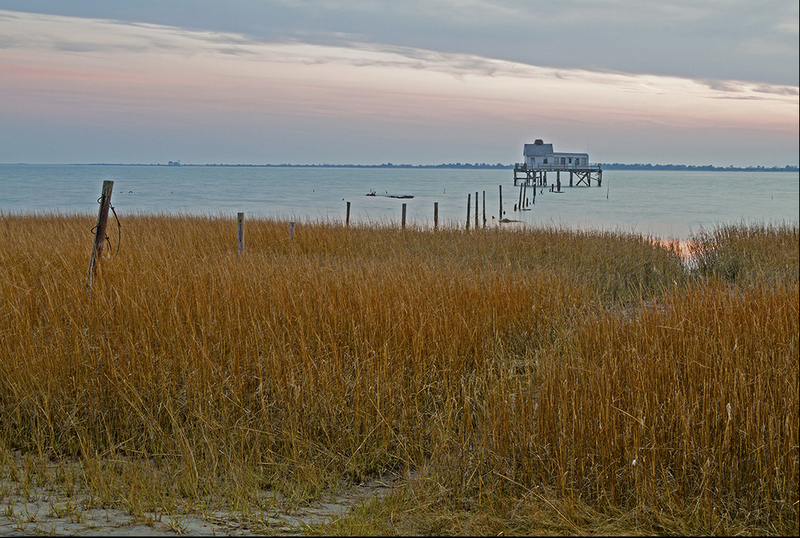 I rejoined South Jersey Camera Club around 2007 and that was the perfect place to learn about photography. Not only did I make a lot of new friends, but I learned to hone my skills through the monthly competitions, workshops and field trips. I want to thank Denise Bush for her help in preparation of the photographs,and Pat Worley for her assistance in the hanging of the show. NJDA cover: I shot this Merlin in Cape May. It was posing for me on top of a dead branch in the path near the Lighthouse. The editor for the New Jersey Dental Association journal asked me for a cover photograph after reading about my participation in The Samaritan Hospice Photo Shows. It was my first cover and I hope she’ll ask me again. 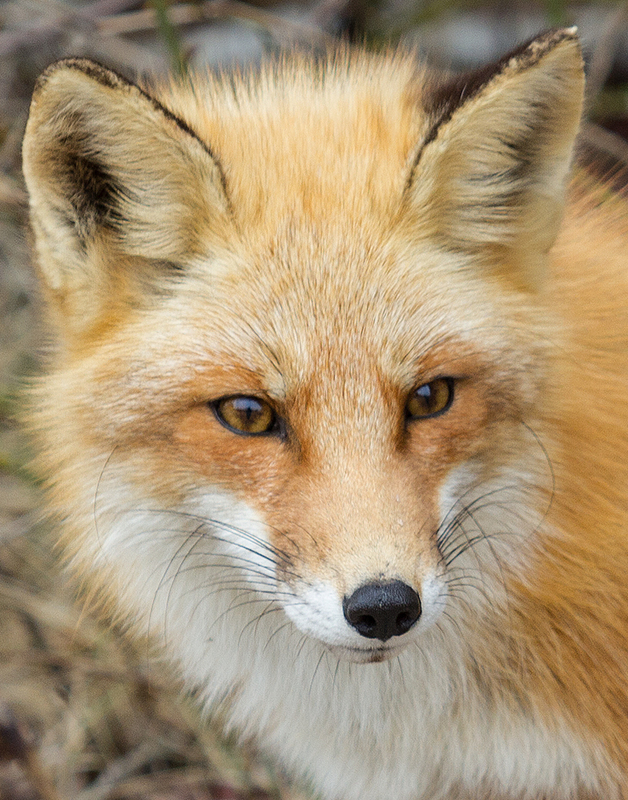 A large portion of images at the show were animal photographs: Here is an image of a fox at Island Beach State Park. We were glad to see that the foxes survived Harricane Sandy, although there was much damage to the park and nearby Seaside Heights. The foxes are very tame and come out looking for scraps of food thrown out by visitors. Feeding the foxes is strictly prohibited, but I saw a lot of tasty treats in the parking lot. The next image is of a mother raccoon at my favorite local spot, Palmyra Cove Nature Park. There is so much wildlife at this park. 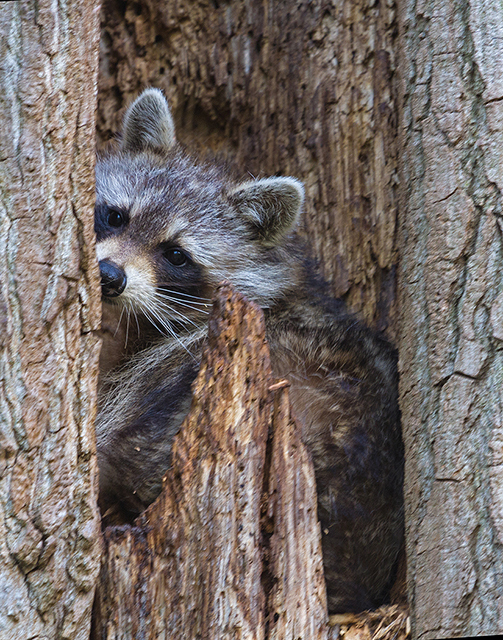 This spring, I saw a pair of nesting owls, two owlets, beavers, turkeys, deer, beaver, a garter snake lunching on a fowler’s toad (I’ll spare you those photos), and this adorable raccoon nestled in a tree hollow only yards away from the owlets. Occasionally, she would rearrange her babies in the hollow and poke her head out for a view of the gawkers. 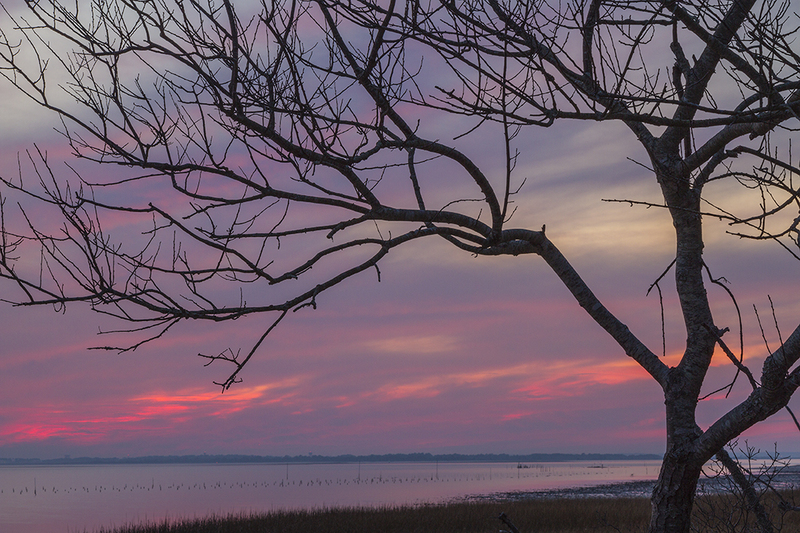 In December 2012, I went on a field trip ( with the camera club) to Chincoteague. 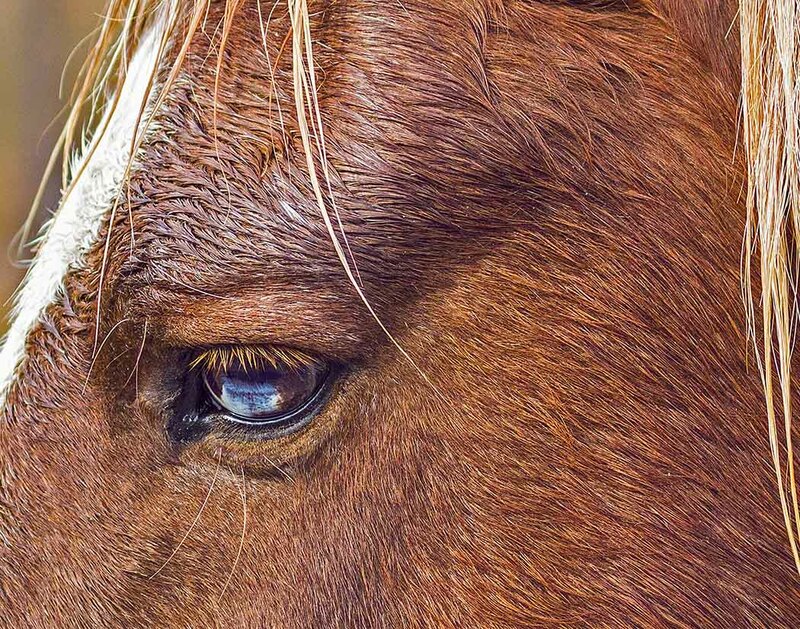 A friendly stallion with a blue (wall) eye approached us. Here he is right before he nuzzled my hand. Two recent trips to the Philadelphia Zoo resulted in the following photographs. This Lowland gorilla was eating a carrot. I noticed that he was holding his ear while he ate. Even before he was eating I saw that he was holding his jaw, as if he had a tooth-ache. Because of my past experience as a veterinary dental consultant, I became concerned that the old guy was having a tooth problem. 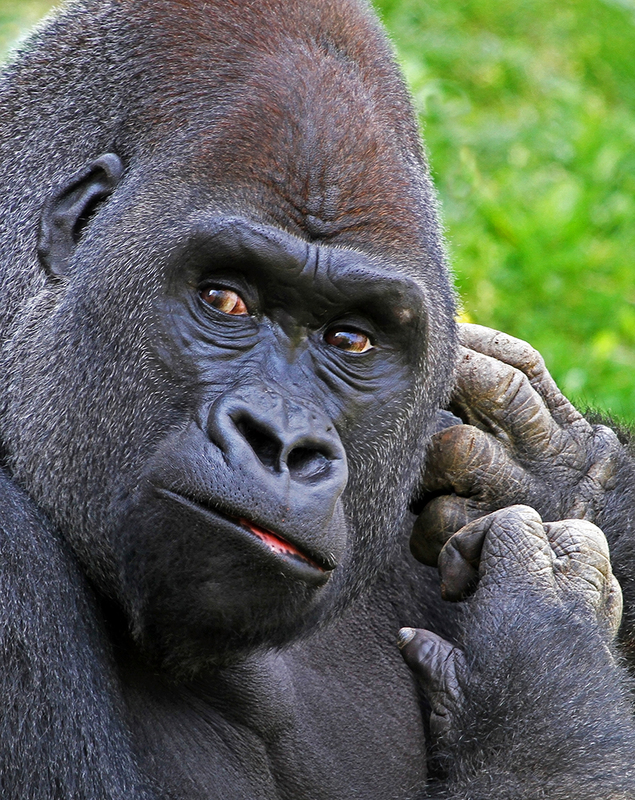 I immediately notified my veterinary-dental colleague, Dr Carl Tinkelman, and told him my concerns and he had the zoo veterinarian check out the gorilla. The aviary was full of beautifully colored birds. One of the most colorful birds was a pigeon! This Southern Crowned Pigeon caught my eye and I caught his! I was in Florida visiting my step-children and grandchildren when this great blue heron landed at the lake behind their house. 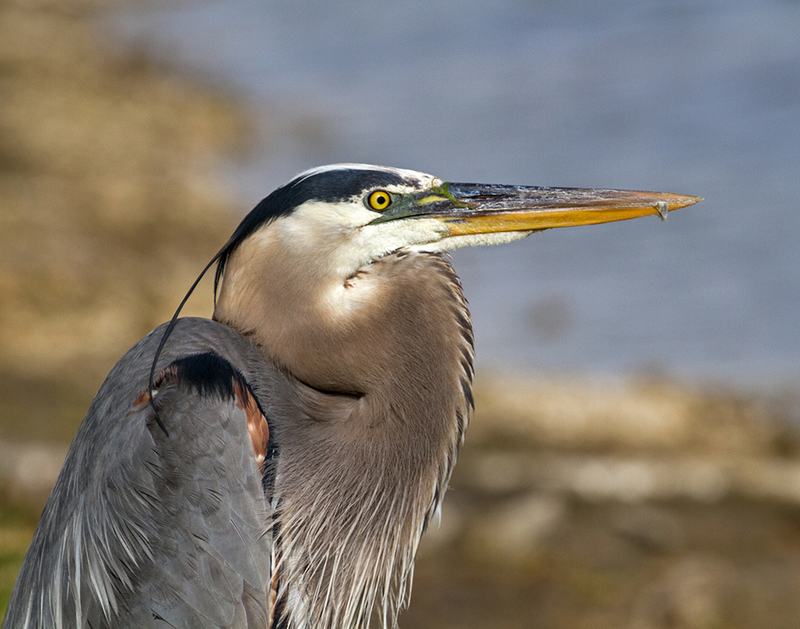 I followed the heron around the lake with my 100-400 canon lens and caught this close-up photograph. My friend Terry Wilson and I were about to head up to Hawk Mountain for the day when we discovered this little creature hanging out on my fence. 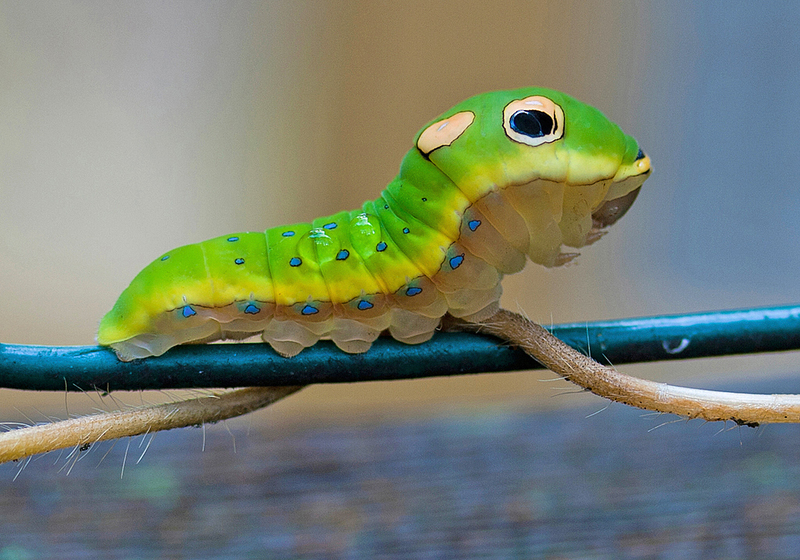 This spicebush caterpillar is a great example of mimicry. It looks like a lizard with a large frightening eye to scare off predators. I won a merit award from Photographic Society of America for this image. My final wildlife photograph is of a red-tailed hawk from Cedar Run Refuge. 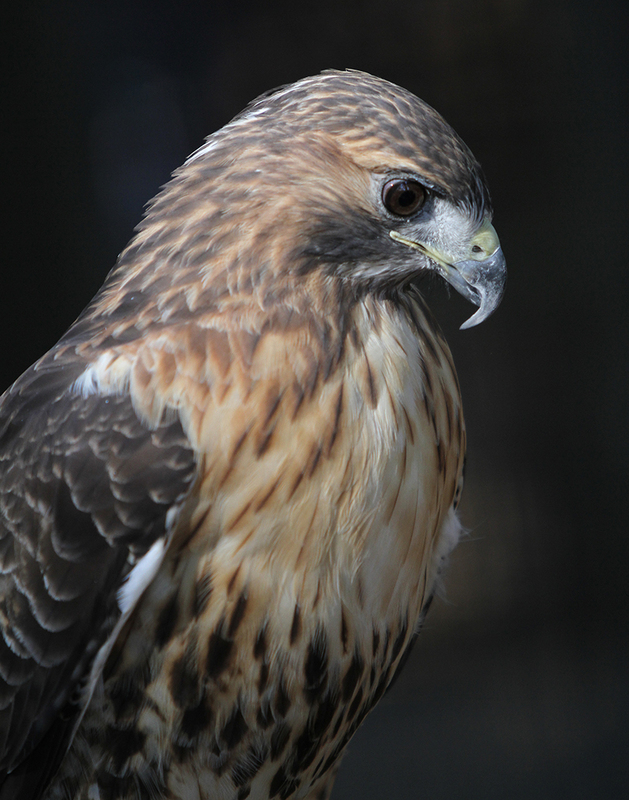 Years ago, I worked as an assistant curator at Children’s Museum of West Hartford., Ct. One of my jobs was to put on a show for visitors by donning a heavy leather glove, putting dead frozen baby chicks in my hand and waiting for the one-winged red tailed hawk to land on my hand. I sure was brave when I was younger. Their claws are deadly! The next section of the photographic exhibit consisted of landscapes. A winter trip to Yellowstone National Park resulted in the following images. 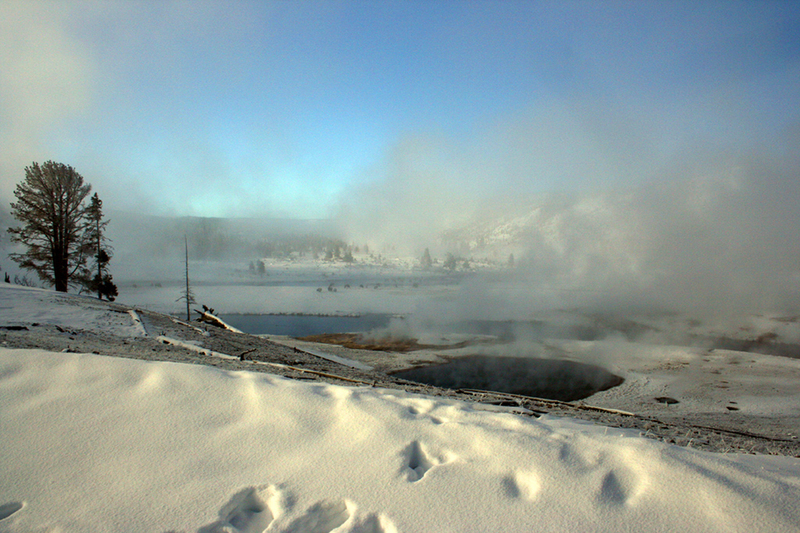 The first image is a view of Old Faithful and other nearby geysers on a chilly 4 degree Fahrenheit day. Yellowstone is magnificent in the winter and a wonderful place to go cross country skiing. 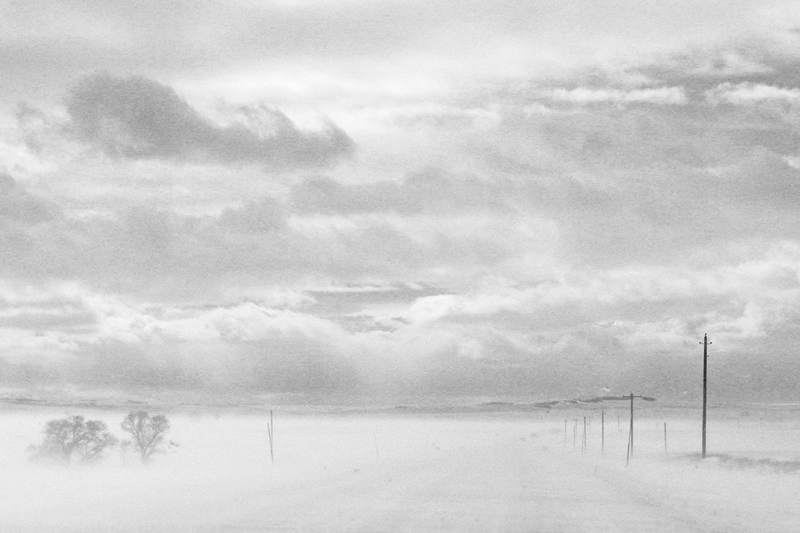 The next photograph was taken through the car window as we drove to Yellowstone in a blizzard. It was snowing so hard that we had to pull over and wait until the snowfall subsided. Note the desolation of the road. 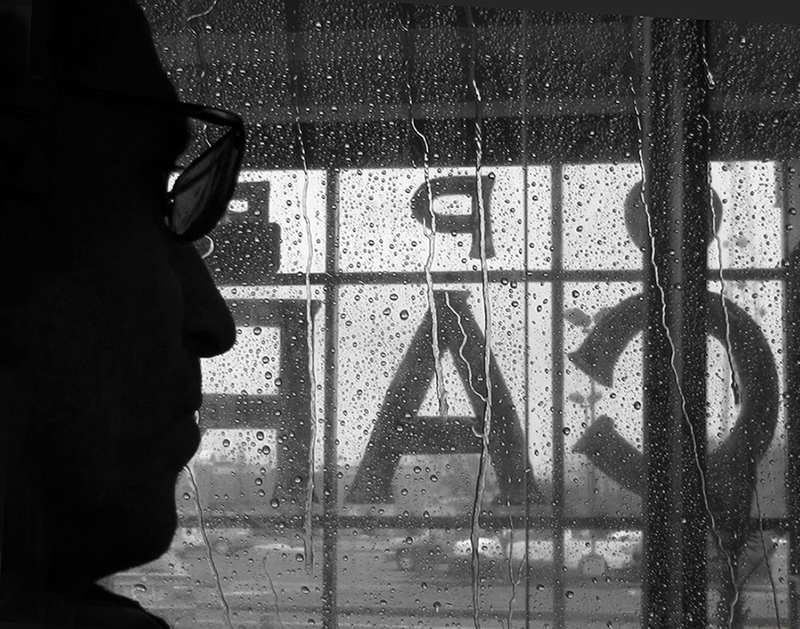 I received a “judges choice award ” from SJCC for this monochrome image. Two photographs were taken on our annual day trip to Hawk Mountain in Kempton, Pennsylvania. 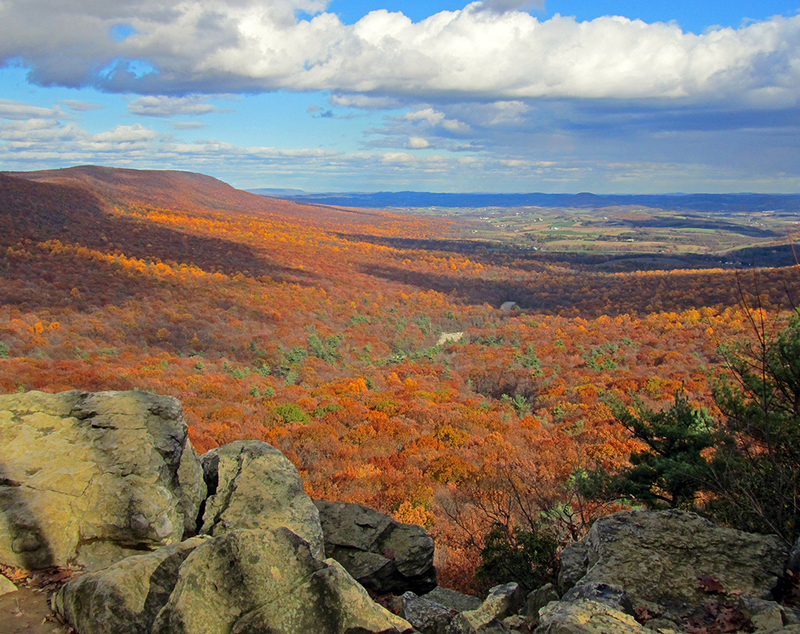 This is a great way to enjoy a day of hiking, see autumn colors, and witness bird migration. The fall colors were spectacular on this October day. 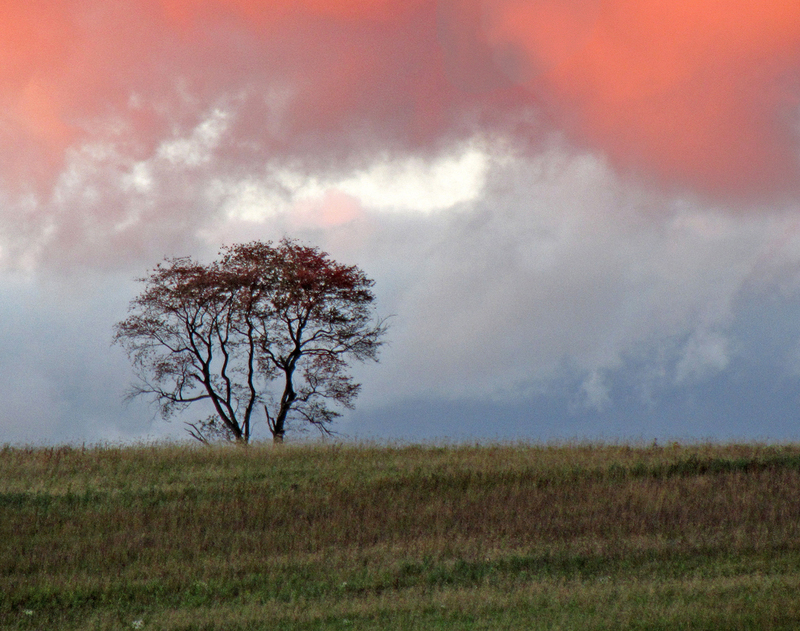 On the way down Hawk Mountain, this solitary tree at sunset caught my eye. My last two nature photographs are flowers. 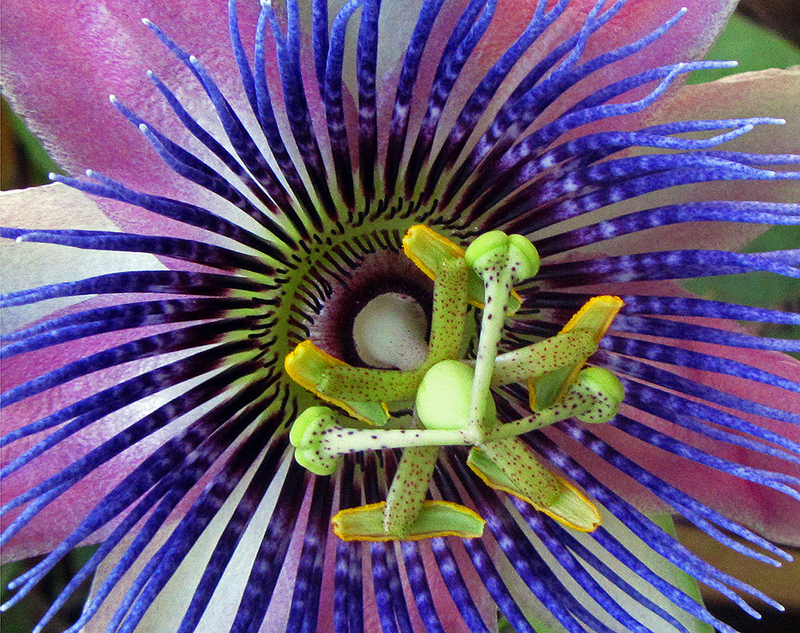 This passion flower was in my girlfriend’s garden. I love the vibrancy of the colors. The other photograph is of the rare and endangered Pine Barrens Swamp Pink. My girlfriends and I searched for it for three years, until finally, this spring, I found several Swamp Pink in full bloom. I crouched near this flower for hours to get this photo. 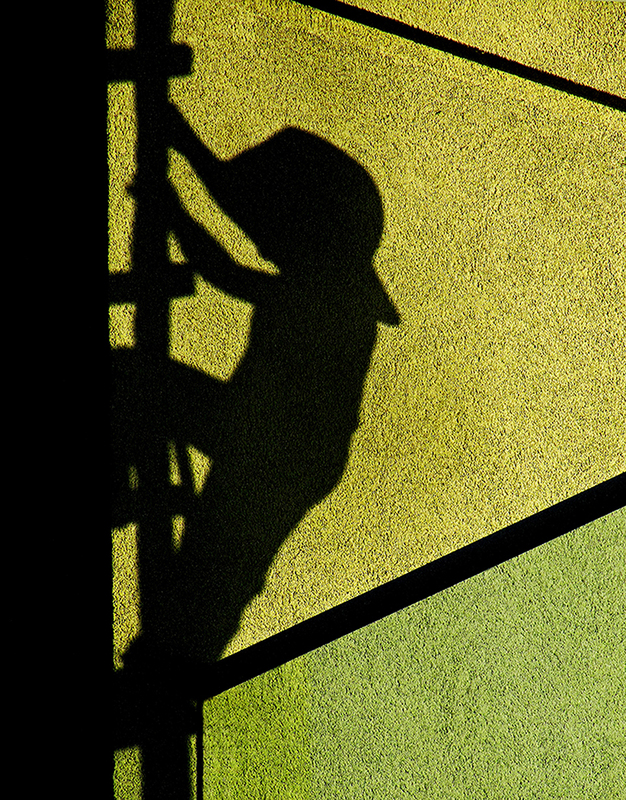 My next photograph was a winner of a SJCC competition for shadows, and two third place wins at the 2012 Smithville Show and Fall into Arts Cherry Hill Show . Outside of a mansion in Longport, NJ, I found this sculpture of a boy in a fire hat.. The sun was setting and the sculpture was casting a shadow on the house. The texture of the building is evident in the background. One week after Hurricane Sandy, we went back to Longport and I was sad to see that the sculpture was gone, a likely victim of Sandy’s fury. The rest of the show consisted of monochrome prints. 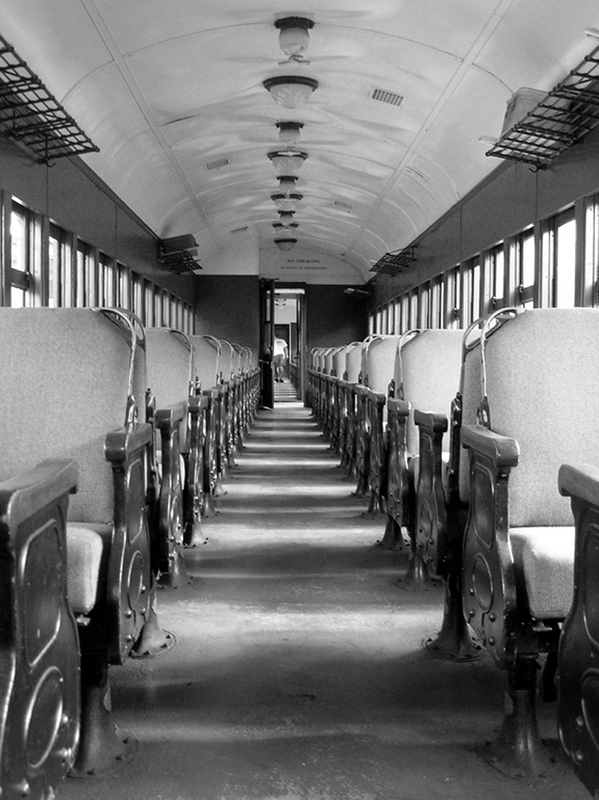 Black, white and shades of gray allow the viewer to concentrate on the mood of the photograph. There are no colors to cloud the mind. 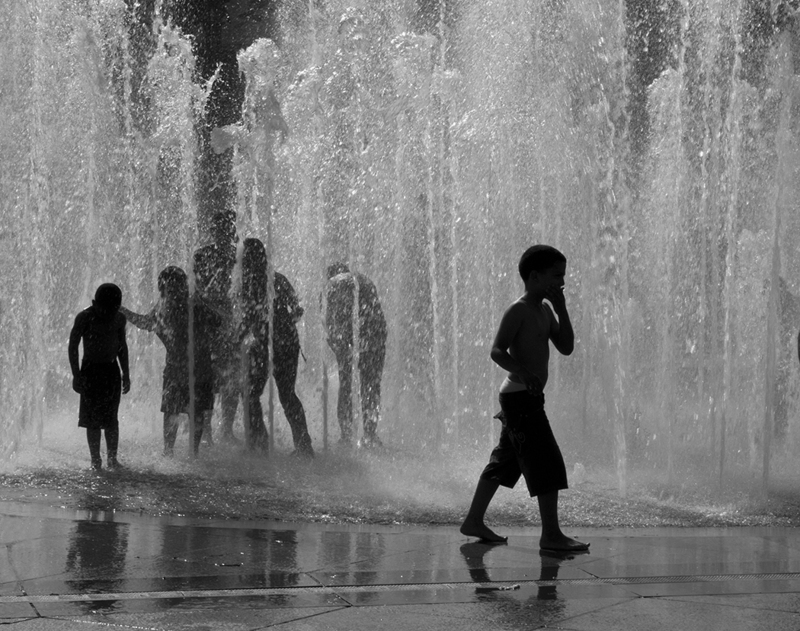 My favorite photograph is of children “cooling off” in a fountain in San Juan, Puerto Rico. 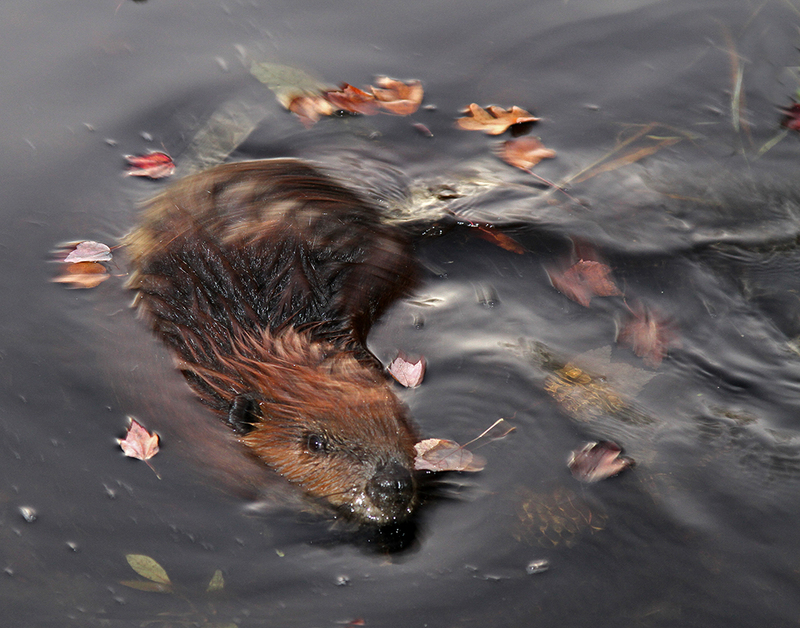 I received two PSA (Photographic Society of America) awards for this photograph. When Stan and I saw the fountain go off, he said, ” There’s the money shot.” Sometimes you just get the feeling that you are photographing ” the decisive moment”. The next image is called “The Car Wash”. It was taken right near my office in Berlin. I like the expression on the driver’s face. You wonder what he is thinking. One day, we rode the old steam train in New Hope . Stan was the last one off. 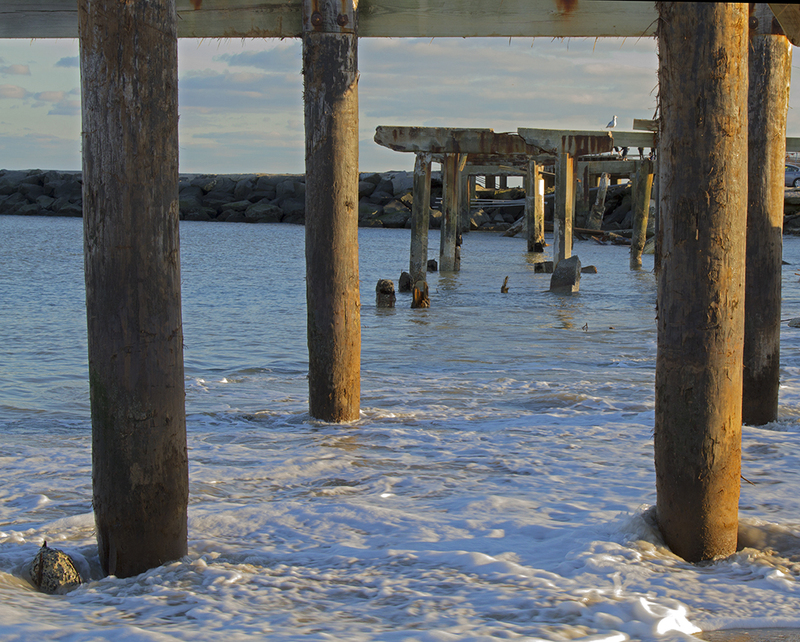 I loved the patterns of horizontal and vertical lines, and the leading lines into the subject. This is called “The end of the Line”. My nephew and neice came to town and we went to Johnson’s Farm. They have a great interactive playground there. 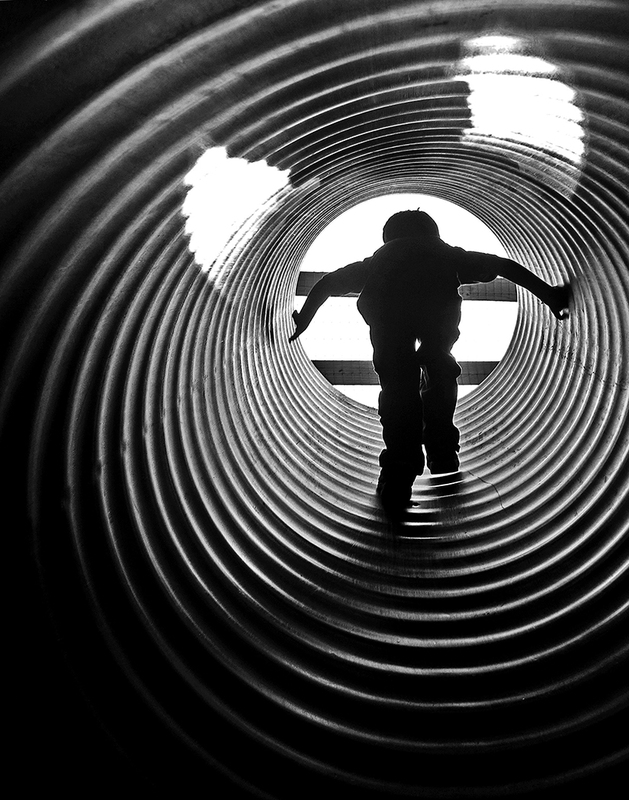 My nephew climbed into this cement pipe and I captured his silhouette . 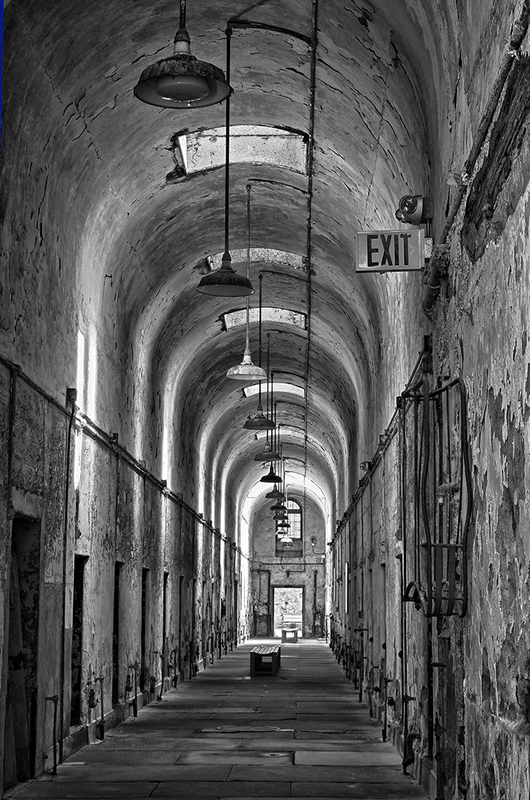 The final photograph was taken at Eastern State Penitentiary. The prison has been uninhabited since the 1970’s. Willy Sutton and Al Capone were two famous inmates. This building is very popular with photographers. I left the sign in the image on purpose. I call this picture “No Exit” . 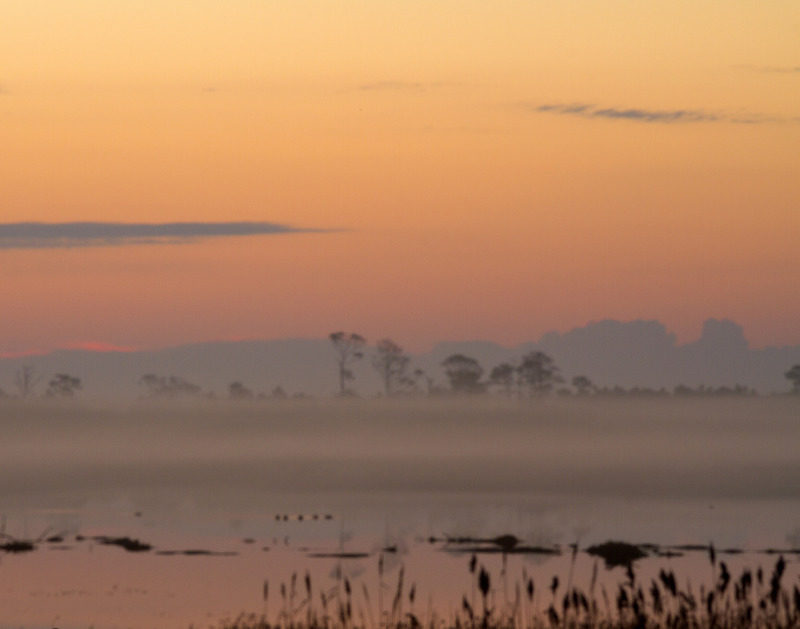 If you love wildlife and especially wild ponies, Chincoteague National Wildlife Refuge is the place for you. I recently visited the refuge with fellow camera club buddies on a cold December weekend. I knew I was in for photography boot camp when I learned of early morning wake up calls for sunrise shoots. We arrived on a brisk Friday afternoon in time for sunset on the island. We trudged about a mile with camera bags and tripods in hand. The hike was worth it. As I was setting up my tripod and camera for a sunset shot, two wild ponies trotted by us, their sandy manes blowing behind them. I only had time to capture the moment in my memory. There was plenty of time, though, to capture a beautiful sunset. As daylight dwindled, the sunset colors became more vibrant and saturated. We lingered until there was no more light, and then hiked back in total darkness with only flashlights to guide our way. The next morning, my roommate and field trip organizer, Pat, woke me at 5:15 am. I groggily threw on layers of clothing and carried heavy camera equipment to the car. We then hiked in total darkness to our first sunrise location. I wondered if it was really worth it to get a sunrise photograph. The sun rose slowly and soft orange hazy light filled the sky. It was spectacular! The best part about catching sunrise is that the whole day was ahead of us. We lingered to take photographs of birds and foggy trees. We drove to N. Babylon, Long Island on Thanksgiving day to spend the holiday with Stan’s relatives. On the way, we planned on stopping in Rockaway. In the 60’s, Stan lived with his family in a high rise apartment building which faced the Rockaway beach. His town had faced many recent tragedies. Sixty-four Rockaway residents (firefighters and world trade center employees) perished on 9/11. 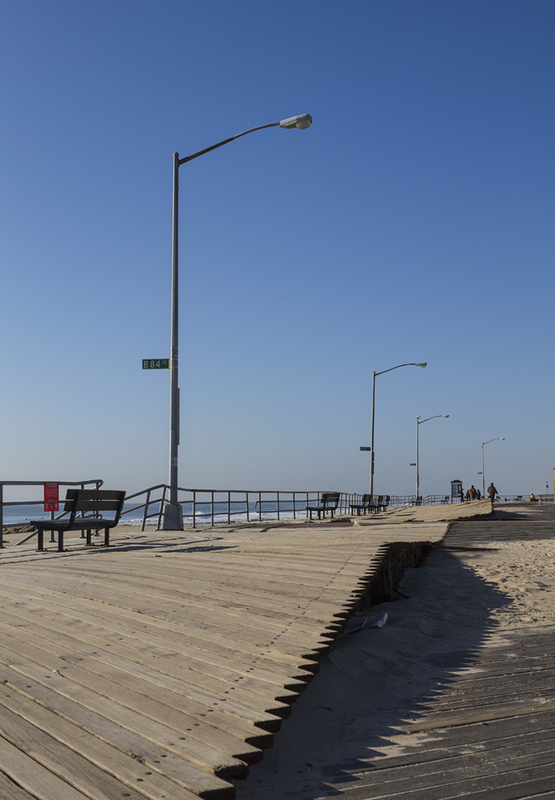 Then two months later, on November 12, 2011, an American Airlines plane crashed in Rockaway, killing 265 people. 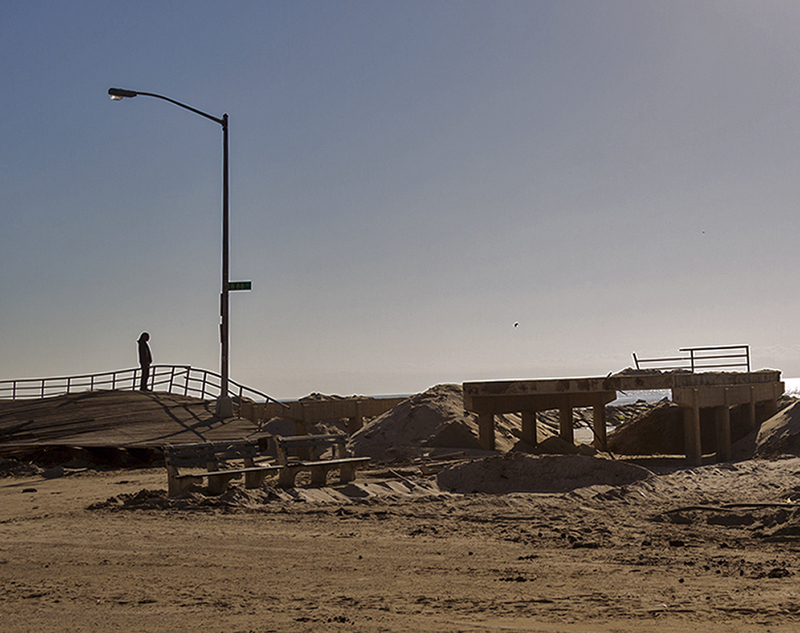 For Stan, Hurricane Sandy’s damage to Rockaway was personal. 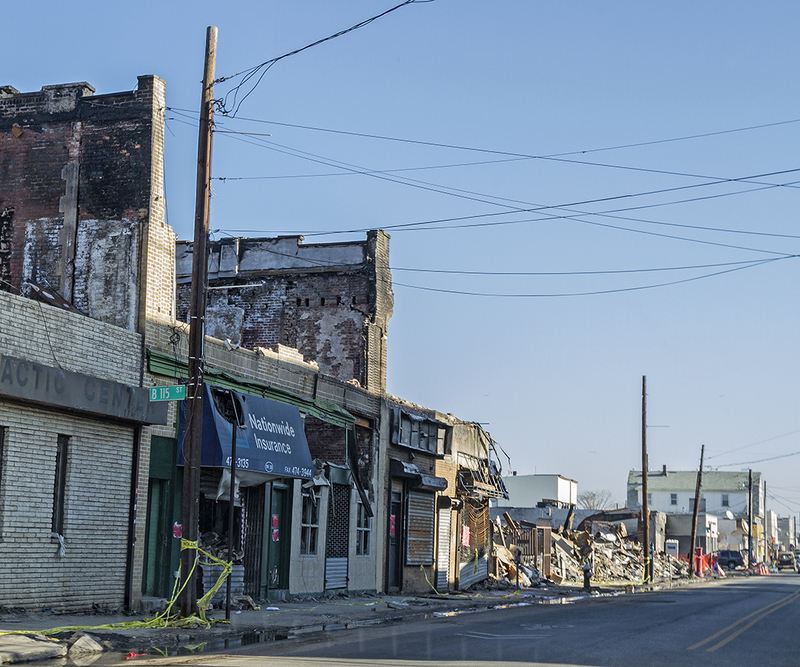 As we drove into town three weeks after the storm, we were struck by how much damage was present. Abandaned, damaged cars could be seen on every sidestreet. Sandy destroyed every car in her path. Residents were still without power. 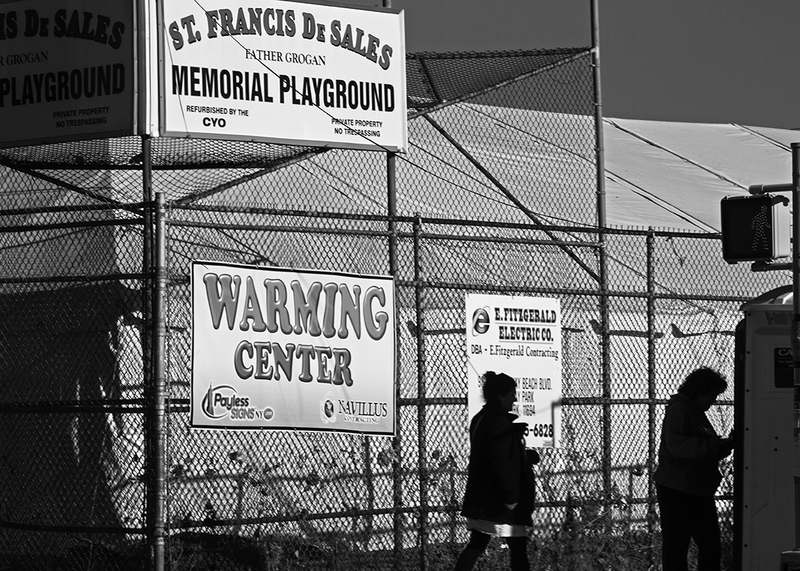 On this day of giving thanks, two women could be seen using the warming station set up along the boulevard. As we drove down the street, it looked more like a war zone than storm damage. 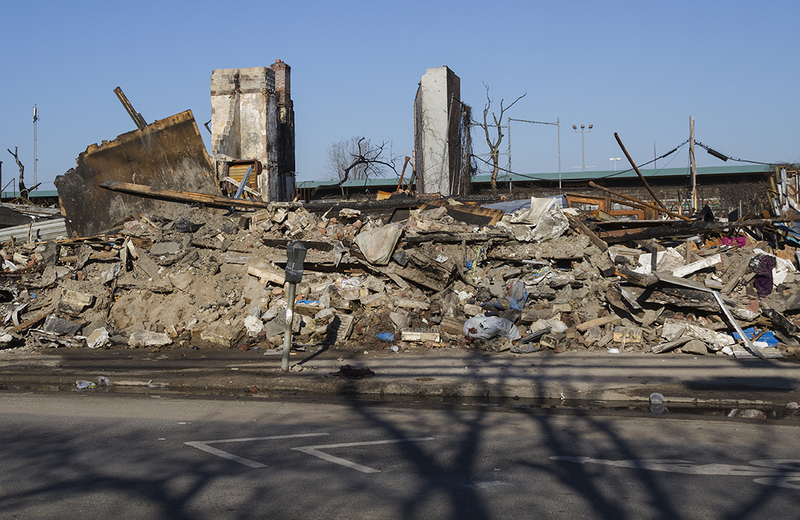 How could the insurance company help when even their buildings were destroyed? Nationwide is on your side! 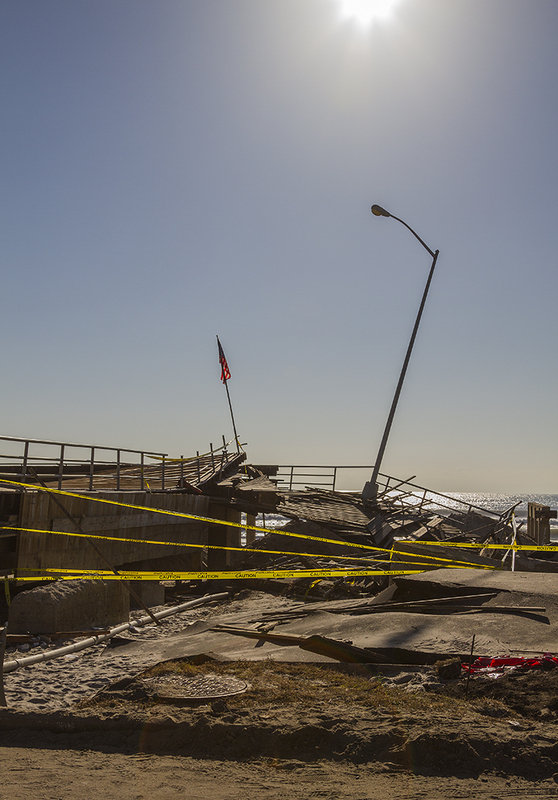 The boardwalk was lifted by the force of the hurricane. Still, the sun was shining brightly and the ocean was calm, as if the storm had been forgotten. 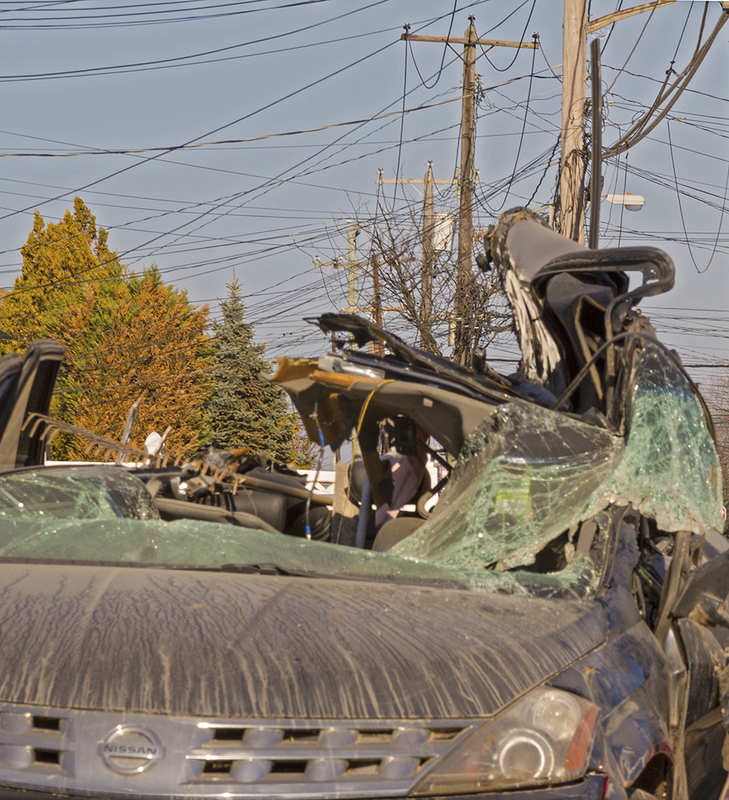 As we drove away from the destruction of Hurricane Sandy, we were both quiet. We were feeling grateful (although a bit guilty) that our family had their electricity restored and that we would be having a warm meal with loved ones. How long will it be before all the storm’s victims could say the same??? Americans will remember the day that Hurricane Sandy hit our shores. Baby boomers will remember it like we remember other horrific days: 9/11, the Challenger disaster, JFK assassination. The biggest difference with this disaster was that it wasn’t man-made. It was a relentless natural storm of epic proportions that could not be prevented, or controlled. We could only prepare and then wait until Sandy finished unleashing her fury on our lives, our shore, and our property. 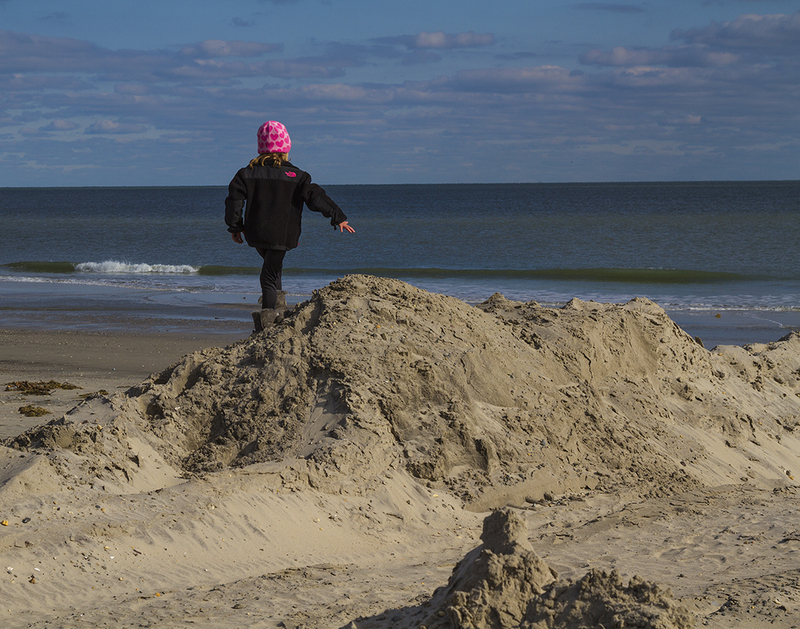 Four days after the storm, we decided to take a drive to Atlantic City. We wanted to view the damage to the island where we spent so many lazy summer days enjoying the hot sunny beach and laughing with good friends. Our first stop was Longport. We could hardly recognize the streets. Sand was piled like snow drifts in front of mansions. 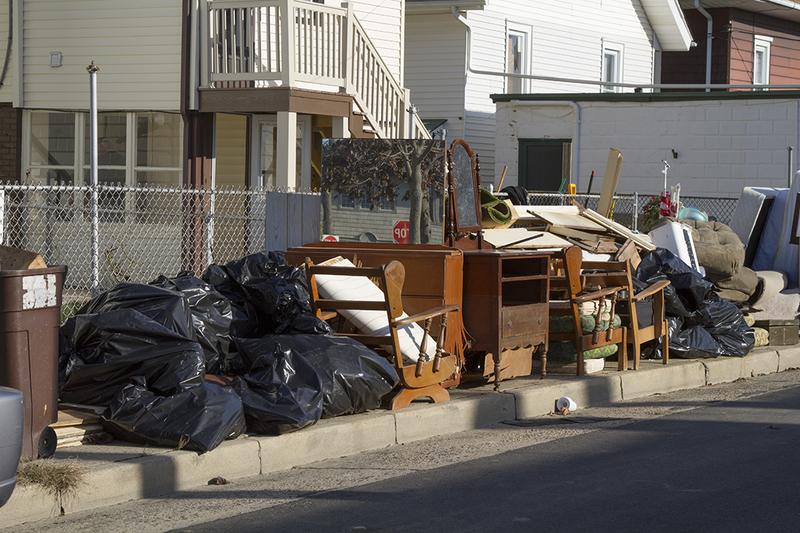 On every street in Longport, Margate and Ventnor, storm-damaged furniture lined the street. 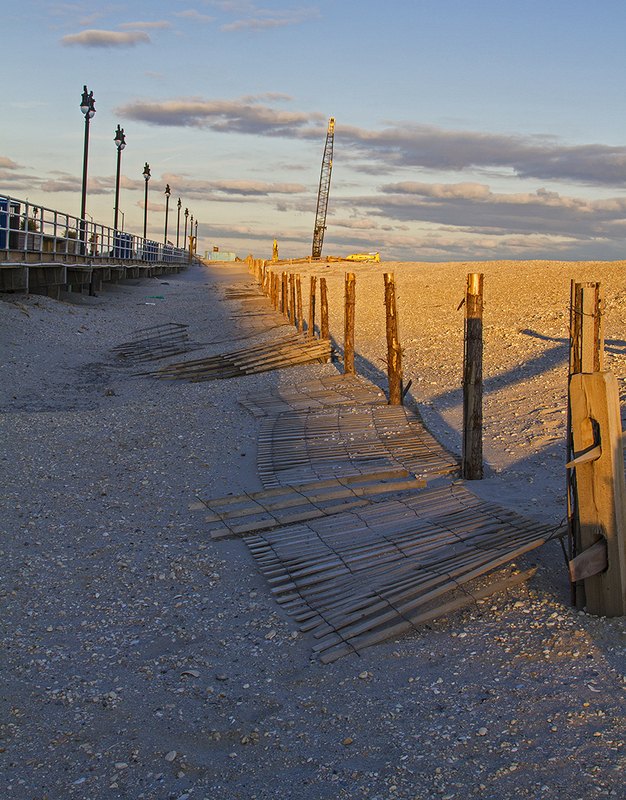 The end of the boardwalk in Atlantic City was only a skeleton of wood.